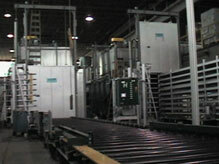 The oven(s) shown are examples of INDEXING BATCH OVENS. As part of an automated process curing application, these electrically heated monsters cure 200,000 lbs. per hour each at 400°F. Equipped in this instance with a controls integration package, these ovens incorporated features of SIEMENS® ASIbus®, PROFIBUS®, and Industrial Ethernet. They provide a workspace of 26 feet long X 6 feet wide X 7 feet high each. The approximate overall dimensions of each oven are: 33 feet long X 13 feet wide X 20 feet high to the top of the lift door frame.